Generally speaking, quality of grips are judged based on girth, hardness, torque and feel, but HFP VD Grip has completely different functions which upgrade performance of clubs. 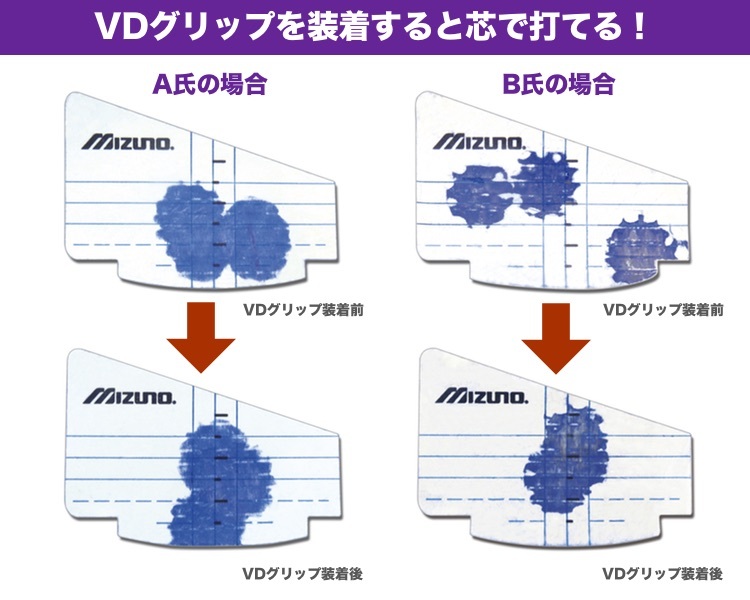 VD Grip is really a mysterious grip, but once you compare HFP VD grip with other makers’ grips on clubs, you will easily understand differences and functions of HFP VD Grip. HFP VD grip conforms to the Rules of Golf. Twisted wire in the rib and high frequency press processing increase transmission speed of pulse arisen in shaft, and it enhances restoring force of shaft. Flexing and turning back of shaft occur in shorter time, and it allows the head to turn back in shorter time in accordance with shaft movement. It leads to better ball engagement. Vibrations in the vertical direction are decreased and lateral vibrations (vibrations toward the direction of swing) in shaft are increased. Because of it, up-and-down movement of head is decreased, and it allows the head to hit the ball at the correct position. It leads to better directionality. Pulse in shaft transmits quicker by the effect of twisted wire and high frequency press. Because of it, flexing and turning back occur in shorter time, and head speed is increased, and it yields longer carry. Head speed of 58 testers (handicap 3~18) was increased by 1.17 m on average (based on the data by the maker). Some testers’ head speed was increased by 1.5~2 m.
Red, orange (endcap paintfill color): golfers using stiff shaft (S or harder) who seek longer carry with stronger ball trajectories. Silver, white (endcap paintfill color): golfers using flexible shaft (R or softer) who want longer carry with better directionality. Silver (white) is recommendable to golfers who feel current clubs ‘heavy’ or ‘stiff’ regardless of flexes. 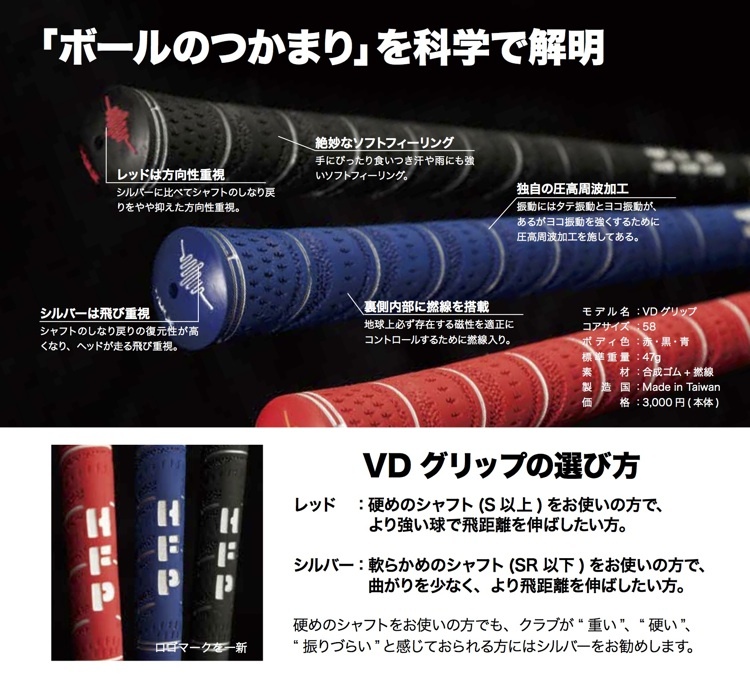 To know the differences between HFP VD grip and other makers’ grips, and functions of HFP VD grip, it is recommended to prepare three clubs using same heads and same shafts and with same club specs (length, weight, swing balance). Two clubs are with HFP VD grips (red or orange, silver or white) and another club with another maker’s grip (47~50 g). Waggle each club lightly by one hand. You will feel the club using the HFP VD grip w/the silver or white endcap paintfill lightest. And then, red or orange paintfilled HFP VD grip. You will feel the club using another maker’s club heaviest even though 3 clubs are same in length, weight and swing balance. You will be able to take back the clubs using VD grips more smoothly than a club using another maker’s grip. If you use a shot mark on face when you test clubs, you will see clubs using HFP VD grip hit balls at sweet spot or near sweet spot because functions of HFP VD grip have the head hit balls at the correct position. Test by drivers: Hit balls at the place where you can see the landing site. You will be able to check trajectory and distance. Test by wedge: Try approach of about 50~60 yards. Balls hit by the club using HFP VD grip will stop on the green because the club using HFP VD grip hits balls at the right position of the head and will get more spin. Grip with red (or orange) paintfill in the end cap is packed in the red logo box. Grip with silver (or white) paintfill in the end cap is packed in the white logo box.